Four years ago today (December 11), we lost my Mom to breast cancer. There isn’t much positive you can say about a horrible event like that, but one comfort I do have is that Mom and I spent a lot of time together and I have a lot of great memories to look back on. The photo above shows Mom doing one of the things she really loved – entering (and often winning) cooking contests. 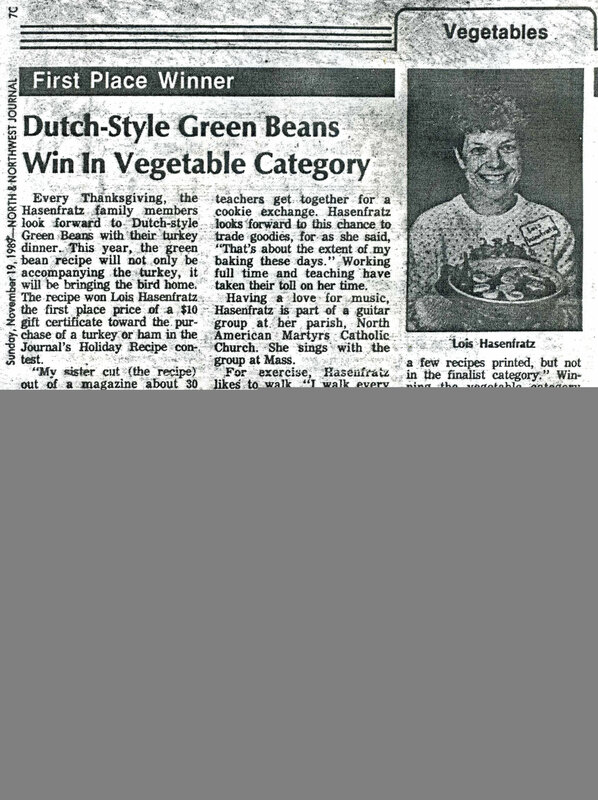 Click the photo to read the accompanying article in the North and Northwest Journal and as a bonus get Mom’s winning green bean recipe! Mom was really good at a lot of the domestic arts. She would not have called herself creative – her craftsmanship was excellent in everything she did but she rarely if ever created a pattern for a project or changed a recipe. I was capable of following directions and would be content with that if I couldn’t think of a way I’d rather do it, but Mom expressed amazement many times at how I would more often create a project from scratch or change an existing one considerably. I’m sure one of the things that enabled me to do this was her support – she never put down my efforts at expressing myself even if the results were pretty terrible! Mom had been a teacher before I was born and liked her career, but she thought it was more important to raise my brother and I when we were small so we had a lot of time with her at home. My love of crafts was well-established before I ever started school. A lot of times I’d sit at the kitchen table and play with plasticine clay and Play Dough while Mom was baking. She’d let me use the cookie cutters to make clay shapes and I have a great memory of her showing me how to make a tiny clay pie, I can remember her rolling tiny clay berries to put in it and crimping the clay crust with a fork. When I was a little older, she showed me how to do my own baking experiments and we had matching kid-size and adult-size cookie presses. I learned to pipe icing on cakes and make things like stained glass cookies out of dough and crushed lifesavers. During my grade-school years I developed a passion for salt dough projects which were trendy at the time. This next photo shows one of Mom’s ornaments made from a kit on the left and one of my salt dough ornaments on the right. Kits played a big part in both of our lives. When I was very small Mom used to subscribe to a club that sent her a different craft kit each month. The cupcake ornament above is from one of those. I always wanted to “help” my Mom with her kits but she gave me my own to do instead. She always did a super-neat job on hers and I loved watching. I got lots of kits as gifts for my birthday and Christmas and many times for an extra treat Mom would take us to Lee Ward’s where we each would pick out a kit for ourselves. Another great treat was a trip to the plaster shop where we’d get blank knick-knacks to paint. That sure was a thrill to spray on the pearlized top coat! Eventually I had quite a collection of plaster flowers and butterflies on my wall to go along with the finished embroidery, string art and hooked rug kits. My brother got into the act too with a plaster frog and a plaster bear head on a plaque. In the summer, Mom used to work on her garden and I would follow her around a lot. I remember her showing me my first praying mantis sitting on her gardening glove. We were both kind of apprehensive about it, but that did not stop me from developing a strong interest in invertebrates which I still have. I had my own little gardening plot for awhile too. I didn’t like winter much, but one thing about it that I did love was long cold Sunday afternoons or after school time spent in the warm basement (where the TV was) working on my projects while watching bad movies on Channel 11. The sewing machine was down there too and a lot of my kits and my brother’s model kits got done there on TV trays while my Mom sewed clothes and decorative items for the house. I didn’t learn the sewing machine until much later because I was afraid of it but I spent a lot of time hand-sewing things like clothes for my Barbies and small stuffed animals and pillows. Later on in life Mom got into some hobbies that even she I think would have called creative. In addition to occasionally being written about in the Journal for her cooking, Mom started writing travel articles for that publication accompanied by her own photographs. Photography and travel were passions we both shared and we spent a lot of time together on local one day trips or longer trips pointing out interesting subjects to each other. Her photo output was prolific! She loved it so much she even made little vignettes out of the decor in the house, garden or of the decorated holiday table to photograph. If she had lived long enough to retire she probably would have been a prolific blogger. She already had some experience making web pages for the travel department at her job, so along with her other interests and skills it would have been a natural progression, I think. In January 2009, I attempted to recreate that cozy winter afternoon creative atmosphere by pursuading my Mom, Dad and brother to make collages with me at their kitchen table. Mom is not in the picture above because she was taking it. This cheered me up greatly (I need cheering up in winter!) and I hope they enjoyed it as much as I did. I encouraged them to cut pictures out of magazines that they liked without worrying too much about why they were attracted to it or what it means. Below is what Mom came up with. I expected that after Mom retired that there would be lots more times like this to look forward too, but it was not to be. Lucky for me, Dad will indulge me by gardening with me and working on projects with me and that helps a lot. And I often bring my sewing over to Dad’s house to work on while he and my brother enjoy a race or some other show on TV. Sometimes they will even work on models! I don’t know if they know how much it helps me to remember those happy times.